The Pennsylvania Association of Realtors® urges all members to contact their state legislators and ask them to support House Bill 1981, which would establish the First-Time Homebuyers Savings Account Program. The program would allow Pennsylvanians to save money toward the purchase of a home, and the money saved would qualify as a tax deduction for their state income tax return. Parents and grandparents would be eligible to save for children and grandchildren as well. To take action, visit www.firsthomepa.com. The National Association of Realtors® is encouraging Congress to pass SB 2155, the Economic Growth, Regulatory Relief and Consumer Protection Act, which loosens regulations imposed by the Dodd–Frank Wall Street Reform and Consumer Protection act. “The Economic Growth, Regulatory Relief, and Consumer Protection Act contains some favorable provisions for the housing industry, including expanding Fannie Mae and Freddie Mac’s use of alternative credit scoring models; holding Property Assessed Clean Energy, or PACE, loans more accountable; and improving access to manufactured housing, as well as easing credit through reduced regulatory burdens on smaller community banks and credit unions,” NAR President Elizabeth Mendenhall said. “Realtors believe that financial regulation needs to be balanced with appropriate consumer protections, and we believe this bill achieves that goal,” Mendenhall said. The bill was sponsored by Banking Committee Chairman Mike Crapo (R-ID) with nearly 20 co-sponsors from both sides of the aisle. The Centennial School Board approved the district’s preliminary budget for 2018-19 that includes a 3.75 percent real estate tax increase. The approval of the preliminary budget is a procedural action every February. The proposed tax increase exceeds the Act 1 index of 2.4 percent, but Centennial is applying for an exception for special education expenses. The preliminary budget includes expenditures of $119.9 million — a 3.6 percent increase from the current year — and revenues of $119.4 million. The school administration will continue to work on the draft budget until the adoption of the proposed final budget, scheduled for Tuesday, May 8, and the subsequent approval of the final budget on Tuesday, June 12. Northampton Township has received a rezoning request by KB Buck Road LLC to rezone the Bucks County Roses property at 1235 Buck Road in Holland to the R-3 Zoning District to permit a townhouse development consisting of 60 units. The developer will give a presentation on the plan at the supervisors meeting on Wednesday, March 28, 2018 at 7:30 p.m. at the township building, 55 Township Road. Click here for more information, including the plan. Doylestown Borough Council will conduct a public hearing on Monday, March 19, at 7 p.m. at Doylestown Borough Hall, 57 W. Court St. The purpose of the hearing is to receive public testimony regarding a proposed ordinance that would establish “general powers and duties of the Shade Tree Commission, permit and street tree application requirements.” The proposed ordinance sets forth the general powers of the Shade Tree Commission, including advising council on location and removal of street trees, suitable species, conducting a Heritage Tree survey, holding public meetings, and commenting on subdivision and land-development applications when requested by the Zoning and Planning Department. The proposed ordinance sets forth standards for emergency and hazard tree removals, permit requirements, sidewalk repair responsibility conditions when damaged by street trees, and violation penalties. A copy of the proposed ordinance can be reviewed at Borough Hall during normal business hours. The Bucks County Commissioners, Bucks County Planning Commission and Upper Southampton Township are holding a Southampton Township Rail Trail Project Public Open House on Tuesday, April 3, from 5:30 to 7 p.m. at the Upper Southampton Community Center, 913 Willow St., Southampton. Developers and planners are seeking public input as they begin the design process to transform the former SEPTA rail line between County Line Road and Bristol Road into a walking and bicycling trail. For more information, view the Southampton Township Rail Trail Public Open House flyer. Ground has been broken for a new development project that straddles the border of Kennett Square Borough and Kennett Township. Cannery Row, an infill redevelopment project on the site of a former mushroom cannery, will be built on Mill Street near the Victory Brewing Company. The 36,000-square-foot development will have a mix of stores, offices, restaurants and two-story apartments. “We are trying to mimic the industrial architecture that you see at the Victory building to create four unique buildings with central green in the middle, a dog park, and access to walking trails,” said Mike Pia, the developer. The project, with 1.3 acres in the borough and 3.9 acres in the township, is the fruit of a partnership between the two municipalities. “Both the township and the borough got together and figured out how to do it without costing the developer an arm and a leg, with two engineers and everything else that would have had to be done,” Kennett Township Supervisor Scudder Stevens said. “I am very pleased with this collaborative effort.” The first phase of construction is expected to be completed in late spring. Toll Brothers is appealing a December 2018 decision by the Westtown Township Board of Supervisors to deny a conditional use application that would have allowed construction of 317 homes at the historic, 322-acre Crebilly Farm. In a 53-page decision, township supervisors cited traffic concerns and preservation of historic views when they voted unanimously to deny the development, which would sit near the intersection of Route 202 and Route 926. The township required that Toll build a connector road parallel to Route 202 and preserve 50 percent of the scenic views. The Horsham-based developer is arguing in its appeal that the supervisors abused their discretion, saying scenic views are not defined under zoning ordinances and that Toll is not required to abide by the township’s comprehensive plan. No court date has yet been set by the Chester County Court of Common Pleas to hear the appeal. West Chester Borough and West Chester University are at odds over whether a stormwater management fee instituted in January 2017 is really a tax. The borough says the university owes $115,000 for fees unpaid in 2017, while the university has balked at paying the new fee, which it considers an inapplicable tax. Andrew C. Lehman, general counsel for the Pennsylvania State System of Higher Education, wrote a letter on behalf of the school, saying: “The university is not legally authorized to pay those invoices because: (1) the borough does not have the statutory authority to impose a storm water management fee on a commonwealth entity, such as the university, and (2) even if such statutory authority existed, the borough’s storm water management fee is a tax, from which the university, as a commonwealth entity, is immune.” Borough Manager Mike Peronne said the fee acts the same as the levy for the borough’s sanitary system does, and that it is not a tax. He said the Clean Stream Act requires the borough to improve water quality in its waterways, and the borough has spent more than $800,000 on four major projects to do so. Borough Council President Diane LeBold said the school has a “huge amount of impervious surface that is washing pollutants into our streams” and should pay up. After visiting the site of multiple sinkholes apparently related to the Mariner East 2 pipeline drilling in West Whiteland Township, state Sen. Andy Dinniman (D-19) wants to halt construction of the pipeline until geologic and safety studies are performed. “You can’t move forward with the construction of Mariner East 2 unless you understand the geology of this area,” Dinniman said. The Pennsylvania Public Utility Commission (PUC) in early March suspended operations on Sunoco’s existing Mariner East 1 pipeline due to ongoing safety and geologic stability concerns related to problems stemming from the drilling of Mariner East 2. The completed Mariner East 2 pipeline will run 350 miles, transporting ethane, butane and propane from the Marcellus shale deposits in West Virginia, Ohio and western Pennsylvania to the former Sunoco Refinery in Marcus Hook, Delaware County. “It seems like Sunoco doesn’t want the public to see or to know what is going on here and just how badly its ongoing failures have potentially jeopardized the health, safety and well-being of this community,” Dinniman said. Jeff Shields, Sunoco Pipeline communications manager, said the pipeline builder was working with the PUC by taking “proactive measures to reaffirm for regulators the safety of the Mariner East 1 pipeline.” Read a statement on the pipeline from state Sen. Dinniman here. In Concord Township, hearings regarding the proposed Concord Ventures development are moving forward again after the applicant requested that township council members and Township Solicitor Hugh Donaghue recuse themselves from hearing and adjudicating the application. Attorney Marc Kaplin, representing equitable owner the Wolfson Group, said the recusal request was based on contact between the township representatives and Mark Jonas, the attorney appearing on behalf of four homeowners opposed to the plan. As a result, retired Delaware County Common Pleas Court Judge James Proud has been appointed as substitute counsel for all matters related to Concord Ventures. In a recent meeting, Proud set new ground rules, such as limiting hearings to two hours, before hearing a recapitulation of arguments from both sides. “We can set dates now for March, April and June, as I expect this will continue into the summer,” Proud said. The application involves a 49-acre parcel, part of an approximately 63-acre tract, where tentative plans call for 29 attached townhouses in six groupings, 166 apartments in three five-story buildings, a clubhouse and in-ground pool on approximately 17 acres of the property. The next night of testimony is scheduled for Tuesday, March 27, at 7:30 p.m. View the full township calendar here. The Delaware County Board of Assessment Appeals has issued a notice that the time to file a 2019 tax appeal from real estate assessment runs from March 15 through August 1, 2018. Forms are available at the Board of Assessment Office or online at www.co.delaware.pa.us/treasurer. The office is located on the ground floor of the county government center, 201 W. Front St., Media. Lansdale Borough Council will hold a public hearing on Wednesday, March 21, at 7 p.m. to consider and enact an ordinance known as the Borough of Lansdale Subdivision and Land Development Ordinance (SALDO). The intent of the ordinance is to regulate the subdivision and development of land in the borough in order to address multiple issues: coordinated development of the borough; existing street coordination; drainage; utilities; open space; public improvements, such as water, fire hydrants, sewage, parks, playgrounds, etc. ; as well as safety from fire, panic and other dangers; protection of the health, safety and welfare of the residents of the Borough of Lansdale while ensuring the equitable handling of all subdivisions and land development plans by providing uniform standards and procedures. A copy of the proposed ordinance is available for inspection at Lansdale Borough Hall, 1 Vine St., the Montgomery County Law Library and the offices of the Reporter newspaper, all during normal business hours. A Norristown man was sentenced to 11 ½ to 23 months in jail after he pleaded guilty to a felony charge of criminal trespass. Yahya Asaad Muhammed, also known as John Brooks, and his sister, Lorna Fretwell, illegally entered the East Norriton home of an elderly woman after her family moved her to an assisted living facility. The pair changed the locks on the doors, paid taxes on the residence and opened accounts for electric and trash service. They also removed personal belongings of the victim and made changes to the home. According to the arrest affidavit, the pair allegedly claimed they were misinformed by unidentified people that they could pay taxes and own the house in seven years. It is unclear how Muhammed became aware that the residence was vacant. Assistant District Attorney Christopher Daniels said, “Their claim was that if they were paying taxes on the home, that they owned the home. That is completely untrue. The home was not on a tax loss list, it was not up for sheriff’s sale, there was no foreclosure. … They were squatting in this house.” Fretwell pleaded guilty to a misdemeanor charge of criminal mischief and was sentenced to two years’ probation in connection with the incident. The pair must also pay $8,825 in restitution to the victim’s granddaughter. The 90-year-old victim died in January. 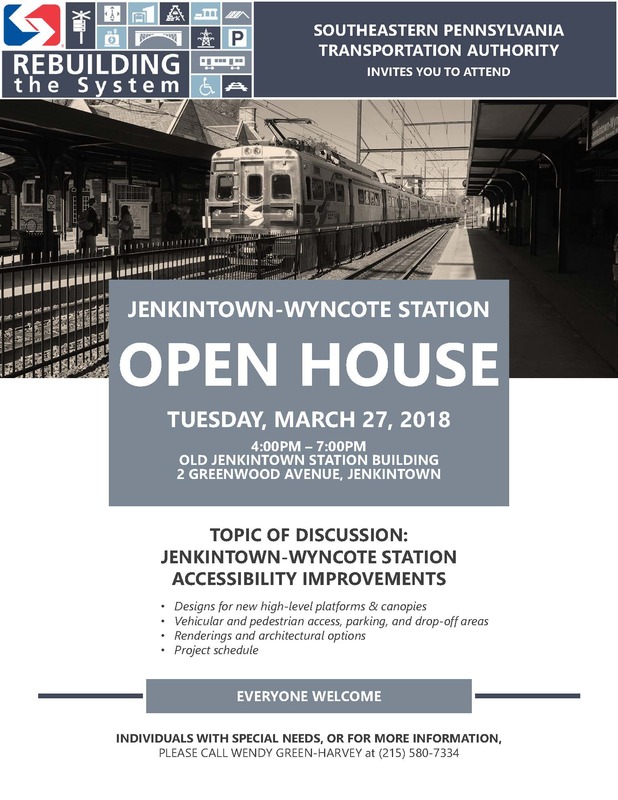 SEPTA is holding a community meeting to discuss upcoming public accessibility improvements to the Jenkintown-Wyncote Train Station and platforms. The meeting will be held on Tuesday, March 27, from 4 to 7 p.m. at the Old Jenkintown Station Building located at 2 Greenwood Ave., Jenkintown. Click here to view a flyer with more information. WHYY’s PlanPhilly has delved into gentrification in Philadelphia with a recent series of reports. Gentrification is described as a trend of middle-and upper-class people moving into poorer areas. The trend carries with it racial, cultural and economic issues. A recent analysis from the real estate website Rentcafe reported that that two Philadelphia zip codes rank among the top 10 most gentrified in the nation. Rentcafe calculated a "gentrification coefficient" using three indicators of change — median home values, median household incomes, and levels of higher education — comparing 2000 and 2016 American Community Survey data. The 19123 area, which spans Northern Liberties, West Poplar and Callowhill, experienced a 203 percent jump in home values, 95 percent growth in household income and a 230 percent rise in college-educated residents. The 19146 zip code that encompasses Southwest Center City, Point Breeze and Graduate Hospital, experienced a 404 percent jump in home prices. Household incomes increased 51 percent, and college degrees rose 106 percent. The Rentcafe analysis illuminates the demographic shifts sweeping across neighborhoods bordering Center City to the north and southwest. Earlier research by Pew Charitable Trust and others drill into citywide trends measuring changes by census tracts, which span smaller geographic areas and offer more defined boundaries. Click here for the full PlanPhilly article and four census-tract level maps that show the impact of gentrification on Philadelphia.